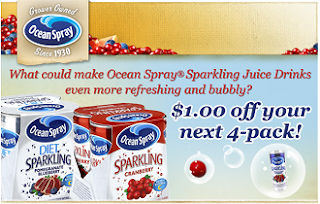 Like the Ocean Spray Facebook page to get a $1.00 off your next 4-pack coupon. They are offering 150,000 coupons exclusively to Facebook fans, so hurry on over and "Like" their page to print yours today! Available in regular or diet, and in 2 delicious flavors: Cranberry and Pomegranate Blueberry, Ocean Spray® Sparkling Juice Drinks are a refreshing and tasty treat that you're sure to love.